Some people in rural Ontario feel that Toronto is a noisy and crowded pit of depravity populated by spoiled elitists selfishly hogging hard-earned government resources. 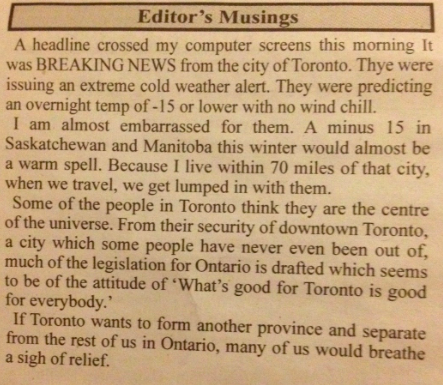 This week, the editor of Elmvale’s free local paper claimed that if Toronto were to secede, the rest of the province would rejoice. Despite slight factual incongruities (Michael don’t you know Torontonians leave the city as often as possible? ), this piece made me grin. I would add that some Torontonians think of places like Elmvale as quaint little backwaters filled with gun-toting, simple-minded, conservative rednecks. That is, if they even bother thinking of rural Ontario as anything more than a hodge podge of ski hills, cottages, and cute little downtown shopping areas. What’s important is that in both cases, “some” means a minority — hopefully. Both stereotypes carry a grain of truth. And as a citry girl, I’m delighted to be able to laugh at both the big smog and the boonies. This entry was posted in Country vs City and tagged backwater, boondocks, boonies, City, city mouse, country, country mouse, Elmvale, Province of Toronto, Smog, Toronto by Mikaela Lefaive. Bookmark the permalink. “Thye were issuing…” Well that’s awkward. Clearly the Editor needs a Copy Editor educated in Toronto to verify his stuff. Toronto waited for me to move before having a real winter. Awesome. I love cities. I visit Toronto as often as I can because it expands my horizons in a way the country can’t. How fortunate are we that we can do both?